The Maine Outdoorsman: 8th Article Published! 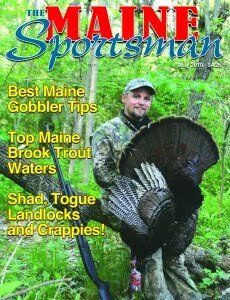 The Maine Sportsman - New England's Largest Outdoor Publication – Will be publishing my 8th story in their May 2010 edition (Pg. 27-28). The article will be part of the magazines “special sections” and highlight hunting turkeys w/ bow and arrow. The individuals featured in the photo accompanying the article is none other than yours truly and that old salty hunter the Duck Man. For more information on the Maine Sportsman Magazine or to order a subscription click this link: http://mainesportsman.com. The article below is the originally submitted unedited version. Enjoy! My boots strip dew from the tall grass leaving behind ghostly footprints that will disappear soon after the sun crests the horizon. Not a single breath of air circulates; the absolute stillness magnifies the sound of my heavily beating heart. The early spring morning darkness and thick fog hang heavy, concealing my approach. A crow screams out in the distance, making me distinctly aware the slumbering forest is awakening, my pace quickens. Suddenly, a gobble erupts from the tree line and my arms break out in goose bumps. Am I too late? Was I seen approaching? Is the hunt over before it had even begun? Hastily setting up my portable blind, I hope against hope that the hunting gods will be kind. There is something distinctly awakening about an early spring turkey hunt. Maine’s forest seems greener, dew sweeter, sunlight warmer and smells more pungent. Perhaps it is the previous months of relative hunting inactivity or the return to the woods after a long cold winter, either way pursuing Old Tom sure has a way of stirring man’s primitive soul. Hunting turkeys with bow and arrow is a sport designed to test the patience of man. Along with the time that must be devoted to practice and preseason scouting, hunters must also be prepared to spend hours in the field awaiting an ethical shot opportunity. Many dedicated archers will devote an entire season of effort and never get a turkey. For a majority of sportsmen, this challenge is what makes the sport exciting. Experienced archers turn these diminutive odds in their favor, by patterning birds before the season begins. Throughout the season, birds will continue the same basic day-to-day schedule even if disturbed by light hunting pressure. Monitor changes in behavior, be flexible and modify ambush plans as necessary to match the bird’s routines. Adaptability insures you are consistently where the birds want to be. Natural terrain features like rock walls, logging roads, pathways connecting fields and other funnels will help direct birds to within bow range. Patience will allow you to eventually connect. Wait and your chance will come, if not this season, maybe next. With the availability to hunt turkeys in the spring and the fall, one missed seasonal opportunity need not mean you will have to wait another full year for a second chance. Hunting Maine turkeys in the spring brings significant challenges. Early May mornings typically hover around freezing, while afternoons can reach into the seventies. I remember several spring mornings waiting for old tom in a synthetic down jacket and felt lined winter boots only to be working the woodlot by the afternoon wearing a t-shirt. Drenching rains are also very common and create miserable conditions for hunters who are unprepared. To be comfortable, being warm and dry are the two primary concerns. Dress in layers, wear synthetic clothing (no cotton) and invest in a pair of high quality waterproof boots. Don’t be afraid to ensure they carry plenty of insulation, as nothing will end a hunt sooner than having cold wet feet. Worn with heavy wool over a light pair of synthetic socks, your feet will stay warm dry and comfortable. This combination can pull double duty, being used effectively during early deer season. A ground blind is an archer’s best friend. Offering a portable means of hiding from Old Tom’s sharp eyes, protection from Maine’s fickle spring weather, as well as biting insects they are worth the investment. To choose from the multitude of offerings, it pays to “try before you buy”. Sportsmen should sit in a variety of blinds and review them for space, weight, visible shooting lanes and available amenities (gear hooks, bow holders, lights). Other important considerations are blinds possessing a degree of water resistance. Some of the more budget conscious blinds are not waterproof. If you select one of these blinds, use silicon spray to coat both the inside and out to insure you stay dry. The final decision should be a balance of cost and function that makes the most sense to you. Decoys are both a benefit and a curse. Mature Toms can be extremely leery about approaching a decoy. If using decoys be sure to set them no further than 5 yards from your position. If a bird decides to investigate this gives you an excellent point blank opportunity. If a bird hangs on the outside perimeter you will still be provided with a 20-25 yard shot. Turkeys adore the rain and some of my most productive days have occurred when it is pouring. Do not be afraid to go out in heavy precipitation, as birds will be out in force. Besides, watching turkeys shake like wet dogs is a comical show not to be missed. A bow need not be set to high poundage for turkey hunting. A lighter weight will allow for a more controlled draw and a longer hold, a definite plus for spooky Toms. To make sure your arrow arrives at the correct destination, archers should study turkey impact shot charts so they clearly understand exactly where a critical shot must be placed. Arrow quivers attached to your bow can be a liability as they change the balance of your outfit. They can also be difficult to manage in the close quarters of a hunting blind. If you plan to use your quiver while hunting make sure to have it attached during your practice sessions. I take mine off the bow once I arrive at the blind, so that it doesn’t interfere with shooting. Plastic bow components do not have the ability to hold up to the wear and tear encountered during a season of hunting. Either buy a bow with quality metal components or immediately replace the parts you have. Nothing is more frustrating and confidence draining, than having to constantly re-set your bow. Practice shooting from the blind at your home archery range simulating real scenarios you will encounter while in the field. Use your gear in the tent, with the clothing you will be wearing, kneeling and from different angles. The more comfortable you are in the blind the more prepared you will be to take a difficult shot when it occurs. When possible, make sure blinds are set-up well ahead of time and camouflaged to blend with the natural surrounding vegetation. Before you begin to stake the blind into the ground, take time to consider the positioning. Set the blind up, sit inside and turn it to determine the correct placement and shot angles. As much as you would like to believe the turkeys will approach from a certain direction, it is more likely they will not. Having the windows lined up with multiple shooting lanes in as many directions as possible will increase your chances. Bring a pair of hand clippers and trim any small branches along shooting lanes that may cause an arrow to be deflected. Long hours in the blind are made enjoyable by the multitudes of Mother Nature’s creatures. Dozens of different songbirds, deer, fox, hawks, porcupines, low flying geese and a variety of other species are on constant parade. To enjoy these sights to the fullest, it helps to carry a pair of binoculars to extend your vision outside of the limited confines of the blind. Additionally having a small notebook available to jot down when and where turkeys are moving will assist you in remembering their activities and then modifying future morning intercepts. Maine in the spring is ripe with biting insects. To combat these pests, ground blinds equipped with shoot through mesh are invaluable. Hunters will also encounter and need to combat the deer tick. These nasty critters carry the serious and debilitating Lyme disease. To protect your person, rake away all leaf matter and debris from the inside of the blind footprint, dose with a liberal application of bug spray and be sure to tuck in clothing. After each hunt your clothing should be run through the washer and dryer to guarantee that no ticks fall off your clothing and find their way into your living quarters. Spouses frown on deer ticks crawling up their legs when they are cooking morning breakfast! Finally, sportsmen should conduct a “tick check”. This ritual consists of stripping to your birthday suit and dancing in front of a full-length mirror to insure no stowaways have jumped aboard. Maine’s turkey population is increasing rapidly and this spring is the perfect time for you to get out and arrow one of these magnificent birds. For many sportsmen the most difficult part of any hunt is the waiting game. Turkey hunting can for some be a quick trip into the woods and at the same time for others it can be a season long event. Persistence will pay in the end for the dedicated archer. The trick is not to lose hope, don’t be disheartened and remember that your trophy bird could be just over the next hillside.